A suit of armor with close up on the breastplate. The definition of a breastplate is protection worn over the chest, or a square cloth with twelve jewels worn by ancient Jewish high priests. 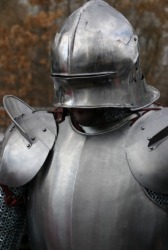 An example of a breastplate is the metal armor worn over the chest by medieval knights. "breastplate." YourDictionary, n.d. Web. 10 April 2019. <https://www.yourdictionary.com/breastplate>. A piece of armor that covers the breast. Judaism A square cloth set with 12 precious stones representing the 12 tribes of Israel, worn over the breast by ancient high priests. A piece of horse tack designed to prevent the saddle slipping backwards. The stole is his obedience and servitude for our sakes; (3) the allegorical school, which treats the priest as a warrior or champion, who puts on the amice as a helmet, the alb as a breastplate, and so on. On the 1st, they marched in procession through the city, dressed in an embroidered tunic, a brazen breastplate and a peaked cap; each carried a sword by his side and a short staff in his right hand, with which the shield, borne on the left arm, was struck from time to time. It was a very richly decorated object of coloured threads interwoven with gold, worn outside the luxurious mantle or robe; it was kept in place by a girdle, and by shoulder-pieces (? ), to which were attached brooches of onyx (fastened to the robe) and golden rings from which hung the "breastplate" (or rather pouch) containing the sacred lots, Urim and Thummim.